What connects Palestinian and Indigenous American scholarship and activism? What does it mean to decolonize settler societies? These are some of the questions tackled by Steven Salaita in his new book Inter/Nationalism: Decolonizing Native America and Palestine, which makes the case for Palestine as an indigenous nation under colonial occupation. Click here to order this already acclaimed book by making a donation to Truthout! In this section from the introduction to Inter/Nationalism, Salaita explains the goals his book aims to achieve, as well as the basis for making the link between colonialism and decolonial struggle in America and Palestine. This book develops a theory of inter/nationalism, an amalgamation of what is sometimes called solidarity, transnationalism, intersectionality, kinship, or intercommunalism. I had no role in creating inter/nationalism. I have merely observed and subsequently named it. 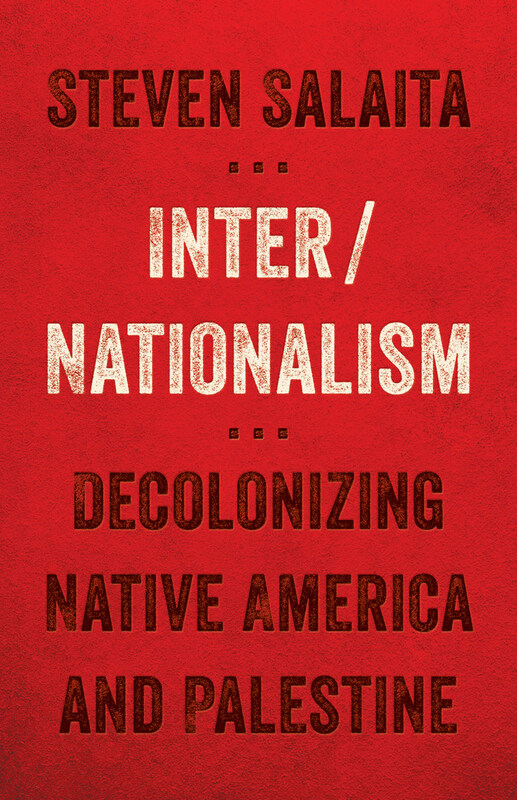 “Inter/nationalism” describes a certain type of decolonial thought and practice — not a new type of decolonialism, but one renewed vigorously in different strata of American Indian and Palestinian communities. At its most basic, inter/nationalism demands commitment to mutual liberation based on the proposition that colonial power must be rendered diffuse across multiple hemispheres through reciprocal struggle. My goal in this book is to define, document, and advance bases for the scholarly and material comparison of American Indian and Palestinian societies. I imagine this project as both an activist and an intellectual document, though I am painfully aware that shortcomings of vision and execution are inevitable. Nevertheless, I hope the analysis I share will contribute to a larger movement seeking to conjoin radical thought within the academy to creative theorization beyond the academy’s hermetic norms. It is useful, if a bit obvious, to point out that the age of transnational humanities has arrived. No longer can scholars demarcate territories of intellectual pursuit based on the self-contained logic of linear group identity (those who feel they can, should not). Most of us would find that sort of provincialism undesirable even if it were a viable way of comprehending human relationships. Despite these ethical and methodological shifts, however, not enough has been written about the possibilities and implications of intercommunal scholarship or about the qualities of intercommunalism. Inter/Nationalism addresses these possibilities and implications, paying attention to dialectics between theorization and decolonial advocacy. More precisely, I explore the ability (or willingness) of scholarship to influence decolonial advocacy. At the very least I try to draw methodological inspiration from such advocacy. If theorists emerging from colonized or otherwise disenfranchised communities have thoroughly decimated the shibboleths of neutral or disengaged analysis, then I would like to examine what scholarship might accomplish when unburdened from the injunctions of objectivity. America and Palestine are the geographies of primary interest. I have already written about both places. My book The Holy Land in Transit was published in 2006, but I compiled the majority of its research in the early 2000s. In the book, I look at some of the ways colonial discourses in North America and Palestine arise from the same moral and philosophical narratives of settlement, examining how modern Palestinian and Native literatures incorporate and react to those discourses. Back then, there was good source material, some of which I had to mine from old documents, but the comparison of Native America and Palestine was limited. Robert Warrior had long before published his classic essay “Canaanites, Cowboys, and Indians” and the American Indian Movement had released numerous statements in support of Palestinian nationhood. Although I was not bereft of materials, over the past few years comparison of Natives and Palestinians has reached a level of sophistication and complexity I never could have imagined in 2006. This book is not meant to be a part two of The Holy Land in Transit, though they share obvious affinities. Rather, I conceptualize it as a synthesis of important comparative trends in American Indian studies and subsequently an analysis of the many roles Palestine plays in the development of ethics, innovations, and debates in American Indian studies, with a particular interest in theories of decolonization. This methodology enables us to move away from comparison of colonial discourses in order to explore the possibilities of comparing decolonial discourses. The shift seems simple, but it represents a significant methodological change, prioritizing matters of liberation rather than merely assessing the mechanics of colonization. In situations of ongoing colonialism, geographic terminologies are simultaneously ambivalent and politicized (their ambivalence often results from their politicization; their politicization often arises from ambivalent affinities). I propose some definitional clarifications, if not definitions, in order to provide readers an understanding of the contexts in which I utilize ambivalent and politicized terms. A good place to begin is with place-names, highly contentious signifiers often sanitized by assumptions of timeless neutrality. I considered for quite some time whether I would speak of “America,” “the Americas,” “the United States,” or “North America.” I ultimately selected “America,” less for simplicity and more for its countless imaginative connotations. All nations, states, and territories are ideas and mythologies in addition to physical spaces, but the idea and myth of “America” resonate in distinctive ways as both a colonial archetype and a geography that traverse languages and borders. Although “America” — and any other identifier not belonging to a Native language — is a colonial locution, it is inclusive of North and South America as well as the Caribbean, regions whose decolonization (and colonization) is ongoing. Thus I would like to reimagine “America” as a hemispheric agglomeration of both discrete and interrelated Indigenous nations. I have a primary interest in North America, the United States especially, and specify a focus on these regions (as others) where appropriate or necessary. When I refer to the United States, I am speaking of the colonial enterprise and subsequent nation-state, as opposed to the Indigenous spaces of America. The primary distinction here, beyond mere nomenclature, is the assignment of a concrete identifier to the nation-state that locks it into a particular historical condition as against an abstract, dynamic conceptualization of the hemisphere, that which precedes, and will outlast, the nation-state. The naming of Palestine is simpler. I deploy “Palestine” to refer to the nation of Arabic-speaking Palestinian people — Muslim, Christian, Jewish, Druze, Samaritan, Baha’i, or atheist — with an origin in the historic land of Palestine, which includes today’s Israel (minus the Golan Heights), the West Bank, and the Gaza Strip. While this population, as with other dispossessed people, has a global presence, its identity is intricately tied to its ancestral home, often deemed the Holy Land, a counterintuitive nomenclature given its histories of conflict When I deploy the term “Israel,” I refer to the colonial entity superimposed on the historic land of Palestine, an entity that continues a decades-long project of ethnic cleansing. “Israel” versus “Palestine” signifies a difference between the nation-state and the nation. Decolonization, which sets out to change the order of the world, is clearly an agenda for total disorder. But it cannot be accomplished by the wave of a magic wand, a natural cataclysm, or a gentleman’s agreement. Decolonization, we know, is an historical process: In other words, it can only be understood, it can only find its significance and become self coherent insofar as we can discern the history-making movement which gives it form and substance. Decolonization is the encounter between two congenitally antagonistic forces that in fact owe their singularity to the kind of reification secreted and nurtured by the colonial situation. Fanon’s phrase “total disorder” does not denote chaos in the sense of a vanquished hierarchy or an absence of law. “Total disorder” describes a rejection of colonial rule and its socioeconomic precepts. What will liberation look like for Indigenous America and Palestine? It is the act of removing order from the structures of foreign authority. This removal of order is total because, according to Fanon, the colonial entity must be rejected completely, subverted, dismantled, decentralized — that is, disordered. The adage “the last shall be the first” announces a rearrangement of both fortune and circumstance. A sense of destiny — one evoked by the struggle for total disorder — also informs the adage. Fanon indicates that in addition to being pervasive, decolonization is inevitable. It is successful at a descriptive level for two primary reasons: once it is described, it is activated and thus irreversible; and it is in the performance and understanding of language that the native can begin the arduous process of psychic and political reimagination. Ultimately, for Fanon decolonization is less about physical resistance to foreign occupation and more about the psychological expulsion of the colonizer (a process that nevertheless can only occur through physical resistance). It is this concept of decolonization to which I adhere, one refined and reformulated through the years by scholars such as Edward Said, Vine Deloria Jr., Gayatri Chakravorty Spivak, Samir Amin, Sunaina Maira, Mahmood Mamdani, Patrick Wolfe, and Neferti Tadiar. The decolonialist is wary of both the practices and self-image of modernity, a dynamic epoch roughly correlated to the rise of industrial capitalism; no community achieves the status of modern without the imprimatur of colonization. Decolonization aims to disrupt the interplay of colonial ethos with predominant conceptions of universal meaning and common sense. I use the term not simply to signify the process of expunging a foreign occupier from one’s ancestral land, but also to identify the extirpation of a foreign occupier from one’s economy, education system, and self-image. Copyright (2017) by Steven Salaita. Not to reproduced without permission of the publisher, University of Minnesota Press.